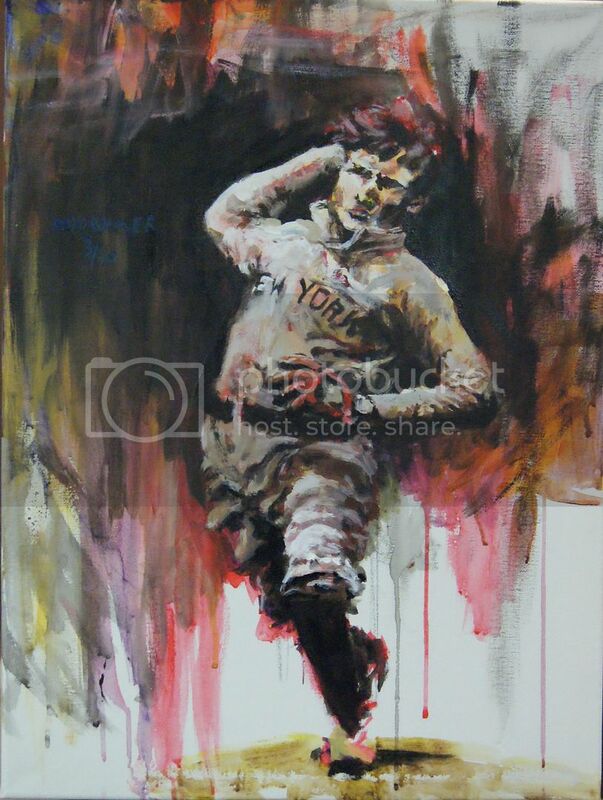 I finished a new baseball painting today; this one of Christy Mathewson. It was a gift for my dad (who occasionally contributes to 3-DBaseball), and will be hanging in one of his baseball rooms soon. Note that Mathewson does remarkably in BSAB (BrushStrokes Above Background) here. Image in the full article. Click image for full-size (~700kb). Also, no, he isn't wearing a hat. He was warming up in the bullpen in my stock image, and, being the dashing man that he was, had not donned his hat. I liked it that way, so he's not wearing one here either. This is great, if you have others I'd love to see them, and would definitely consider trading some of these dead green presidents to take some off your hands. I love it! I wish I had the spare cash right now to commission a piece. I like the way you used light and dark in this piece. It reminds me a little of Rembrandt chiaroscuro. Thanks, Mike. I think working from black-and-white photography really suggested the chiaroscuro-like approach. The photography from that era really pushes the highlights and shadows, and I wanted to keep some of that kind of look in the painting even after adding in more mid-tones to better define the form.